I tend to make most of the cards I give with gifts, especially in the last couple of years. I really wanted this one to resemble balloon letters but with a more colorful twist. I really enjoyed complicated pop up cards a few years ago but lately I really like simple white cards with a pop of something. I began with one small sheet of white cardstock paper that’s folded in half to be the card. Then on the back of some scratch cardstock paper, I drew in the letters backwards and cut it out. With some left over twine from my previous dreamcatcher DIY, I taped one small strip onto each letter. Then, I cut out a small short strips of cardstock paper to use as the “stand” for the letters to pop up; they didn’t have to all match the same size to give the balloons variety when you tape them onto the card. I folded a small section of the strip before folding it into halves twice to create 5 sections; once I fold it into a cube, the smaller section is where I place the double sided tape and taped it onto the back of the letter. I repeated again until all the letters have a “stand” and I could proceed with arranging and taping them onto the card. Once I taped and arranged all the letters on the card, I tied all the strings together and taped it in place (I placed a small piece of double sided tape on the back so it’s not visible). The card is now complete! 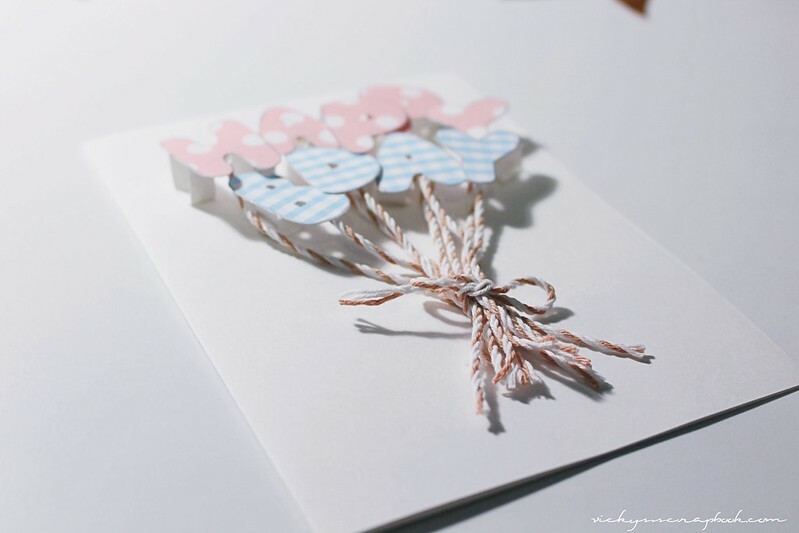 Do you like to include greeting cards with your gifts? SO cute and SO creative ! Today was actually my friend’s birthday lol. I’m so glad I found this! It’s so cute and creative. I usually just go for a card or a piece of paper folded together and decorate it, but i’ll be trying this next time! I tend always make cards with gifts. Let me know how yours go! Hehehe thank you so much for the card ❤ I love it! 😀 So cute! I'm going to hang it up at my desk at work! This card is absolutely gorgeous. You are very talented and I bet your friend loved it Vicky. Yes, I always include a card with the gift! And I love how your card looks!